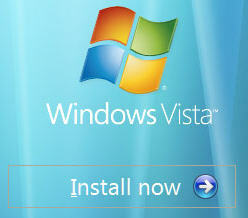 Windows Vista is available as a free download on Microsoft website. The software that will expire on June 1, 2007 so you still have an year to play around with the new OS without paying a penny. You can safely try Windows Vista Beta 2 as it can dual-boot with Windows XP. So you don't risk loosing any of your programs settings or data files. In order to setup Windows XP system to dual-boot Vista, you will require a partitioning utility like PartitionMagic to create a new Windows Vista partition on your hard disk and then install the OS by booting from the Windows Vista Boot DVD. Gina Trapani has a detailed tutorial on how to dual-boot Vista with Windows XP. Once the process is complete, you'll get a choice to boot into XP or Vista. Important: If you haved downloaded the Windows Vista ISO installer, you will required a DVD burner to create a boot disk. The installer is 3.5 Gigs and won't fit in a CD-ROM. Also, Windows Vista Beta 1 uses a different bootloader (bootmgr) than Windows XP (ntldr).